We've put that one on hold indefinitely, we're running into some trouble with the tooling so we are being conservative and taking it off of the release schedule. Which sounds to me like they're still aiming to release it, just not any time soon. Not to worry though, there's still plenty coming from Round 2 this year, with the Deep Space 9 kit re-release to include a new mini USS Defiant, plus Round 2's second re-issue of the 1:1000 scale TOS USS Enterprise, in a metal lunchbox, and their all new 1:350 scale TOS USS Enteprise. 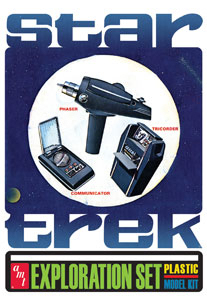 If you're really itching for some TOS props, you could try and find an original copy of the AMT kit. Or go for DST's various props, which have the added advantages of being full size and having lights and sounds!